Metalite has supplied CALKIT™ systems to oil and gas exploration and extraction companies around the world including Shell, BP, LASMO, PDO, Arco, Elf and Plus Petrol. 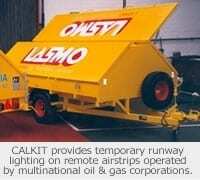 The CALKIT™ portable runway lighting system is a reliable, low cost option for delineating airfields in remote areas where local mains power is not available. It enables unlit airstrips to be used safely during the hours of darkness allowing extended periods of logistical support or urgent medical evacuations.CALKIT™ has been used during some of the world’s largest on shore oil and gas projects including Insalah, Algeria and Babo, Indonesia.